as it was printed in India by the TPH in 1925. The first letter from a Master of the Wisdom ever received was in 1870 by Madame Fadéef, the aunt of H. P. Blavatsky. When the Society for Psychical Research accused H. P. B. of forging the letters of the Masters, this letter was in Russia. It is in the handwriting of Master K. H., which the S. P. R. said was concocted by H. P. B. But H. P. B. was thousands of miles away when her aunt received the letter. Similarly was it with several other letters which were precipitated in one country when H. P. B. was in another. 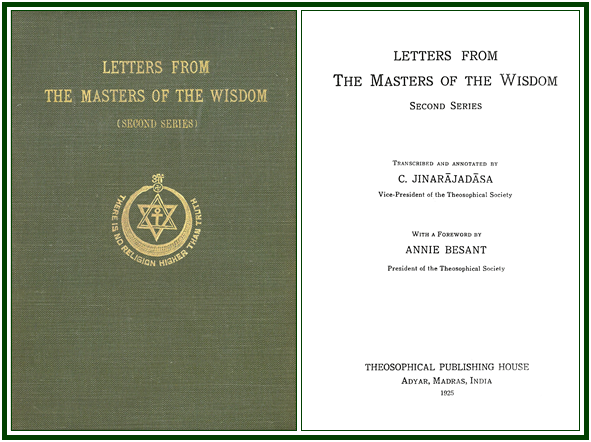 Readers are invited to see in our associated websites the book “Letters From the Masters of the Wisdom – First Series”, by C. Jinarajadasa (Ed. ).